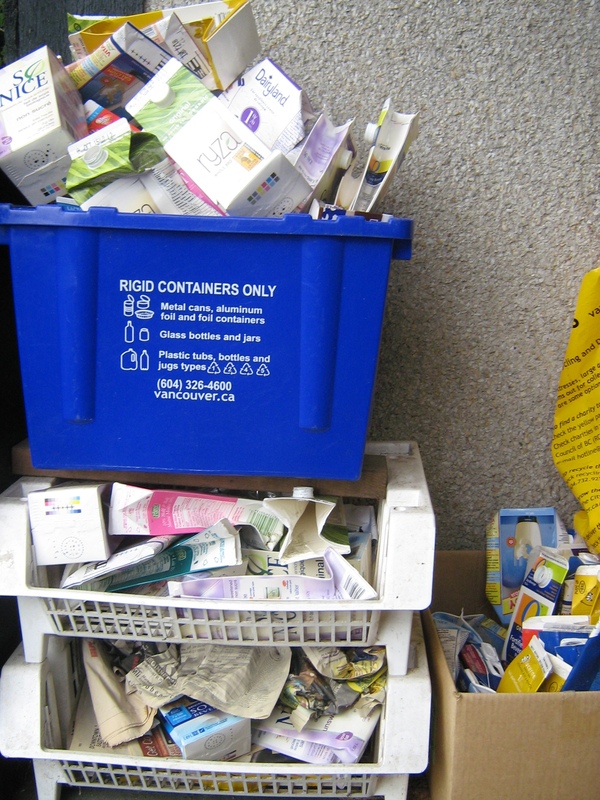 I’ve come to realize that recycling isn’t the answer to waste reduction. I constantly have to remind myself that reduce, reuse, recycle isn’t a trio of equally effective environmental terms, it’s a hiarchy. And recycling comes last. It is the least effective means of waste reduction. Truth be told, most recycling is actually “downcycling” where the product is reincarnated as something further down the quality chain and one step closer to the landfill. For example, plastic milk jugs don’t get made into more plastic milk jugs, they get made into park benches and such, which means that every plastic milk jug, although capable of being melted down into other products, is in itself made of virgin plastic. I’m treading a thin line here because we still buy plastics as long as they are “recyclable”, but the more we get into this project, the more we start to doubt our own rules. I think they might need to be tightened up a bit. However, I’m digressing from the original point of this post. The point was that it’s AMAZING what can be recycled out there. I figure whatever can be recycled, should be. Even if it’s just prolonging that trip to the landfill, isn’t that better than nothing? These days people are recycling/downcycling electronic components, appliances, even batteries. I just heard about a program in Japan where you can recycle your dentures and another one in the UK where they are recycling gum. That’s right, chewing gum gets recycled into an aggregate that is used as an underlay for sports running tracks and other construction projects (plus the collection bins, hilariously called “gummy bins”, help keep the streets clean). This is, of course, a great example of the hiarchy of reduce, reuse, recycle. It’s probably better all-round not to chew gum in the first place, but if you must, at least it’s nice to know that it can be used again for something other than laying about on the pavement and getting stuck on someone’s shoe. We have a “I’m not sure” bin going in our house right now for things that we don’t want to throw out, but aren’t sure if they are recyclable. One of these days I’m going to get organized and call the Recycling Council of British Columbia to help us figure out where to take things. Until then, our “I’m not sure” bin is getting alarmingly more full, not to mention the ridiculous pile of cardboard milk cartons waiting for months to be dropped off at the depot! You’re so right about the order – reduce, reuse, recycle. And it’s perhaps the only downside of improved recyling facilities, that we use it as a justification for continuing to buy plastic instead of looking for alternatives. It’s the same with fuel – we demand subsidies to reduce the price rather than reducing our own consumption.